I really love Instagram and my Instagram followers. Instagram has so many great photos to see of all my pals. Here are my July Instagram favorites, but I posted lots more, so go take a look if you haven’t visited in a while. This photo is one of the last ones mom took in my hotel room at the Sheraton Grand at Wildhorse Pass in Chandler, AZ, when I was on my big road trip. I think it is my favorite of the month. The room had such pawsome sun puddles and Mom says it is that great natural light that really shows off my eyes. Mom is always trying to catch me off guard when she’s taking photos of me because I like to look away when I see the camera pointing at me. I like to know what my pals are up to and how their day is going. They’re not always forthcoming with that information! We have a high shelf on the wall in this room but I also like getting on top of the book shelf attached to mom’s desk. I can survey the whole room from here. How could I not include this photo of me and mom taking a snooze together? Sometimes, in the afternoon, mom will take a little nap and that’s my favorite time of the day. Sure, I nap most of the time, but I prefer doing it with mom. I am always so helpful. Here I am trying to show mom how important it is to put “take a nap” on her to do list. Since today is Caturday Art day, I helped mom artify one of my Instagram photos. Hope you like it. Until next time, my furiends. Have a great day and tell me What’Z UP in the comments. 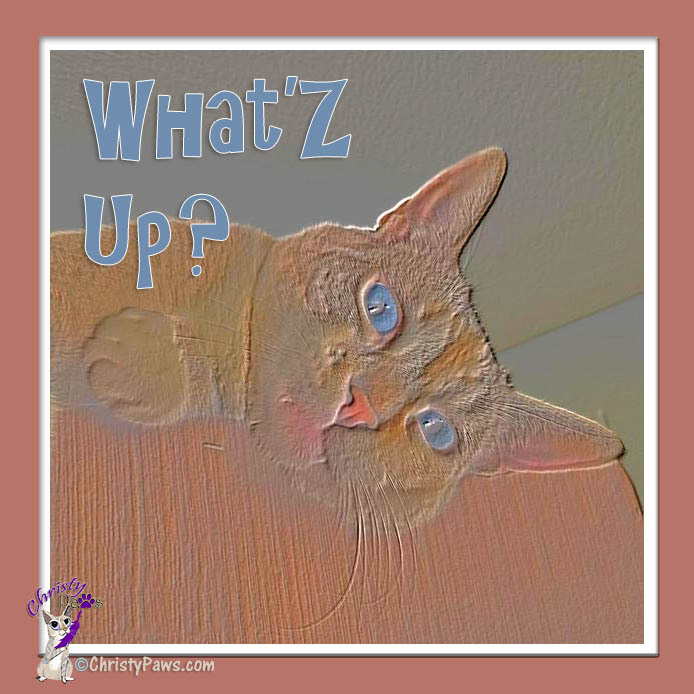 We are joining the Caturday Art Blog Hop hosted by our friends Athena and Marie. Click on the badge to see more great art or to join in the hop. I love your Instagram pictures Christy! I don’t have an Instagram account yet – I think Instagram is great, but one more social media account to manage is too time consuming for me now. Mom says she feels overwhelmed sometimes trying to keep up with it all! Gorgeous photos, Christy! I think your Mom is right. That light brings out the depth of the blue of your eyes. I’m glad you had a fun time at BlogPaws! What a great group of photos. We can see why they’re your favorites. super sweet photos!! We don’t have as much time for instagram as we would like to…we seriously don’t! Mom says she doesn’t either but I make her do it anyway. I think she really just likes seeing all those photos of me! Christy. You. Are. Drop. Dead. Gorgeeuss. Mee iss *swoonin* all over thee place as iss LadyMum!!!! Oh, handsome Purrince Siddhartha, you are really making me blush, kitty style. Thank you for the complement. Yur so welcome mee sweet furend!! Ddi you know LadyMum has yur foto on her Dailee Planner???? Shee says you remind her of both her gurlss: Nylablue an Mingflower…. I love your photos, Christy. You are so precious and beautiful! Your pictures is glorious! Mes loves each and every one of them! Thank you sweet and beautiful Nellie! I love to hear from you. Aw, Austin, you make me blush. Hugs to you! Great IG shots! We’re not on IG since TW can’t watermark from the ipawd. Love that art! Do you use Prisma for IG? Mom loves the app called PS Touch. It cost $10 when it first came out but it is from Adobe and does all the basic things PhotoShop does. Sadly, they have discontinued it and will not be doing any updates. Mom says she’ll keep using it as long as it works! It looks like Photoshop Mix is what she’ll go to when it quits working. Does TW have the Adobe subscription version of Photoshop? Great IG shots, Christy! And I’ve only seen one of them before! Thanks, Summer. Glad you got to see the ones you missed. I love seeing all your fancy photo shoots on IG. Those are some terrific photos of you, Christy. Your blue eyes are stunning! I’ve fallen in love with Instagram too and these are great! Your artwork is pawsome too! Those are all great photos of you and I love the art too. You have the most amazing eyes.